"These new studies support previous findings that reducing sodium from very high intake levels to moderate levels improves health," said committee chair Brian Strom, the George S. Pepper professor of public health and preventive medicine at the University of Pennsylvania's Perelman School of Medicine. "But they also suggest that lowering sodium intake too much may actually increase a person's risk of some health problems." Those problems, he said, could include heart attack or death. The current Dietary Guidelines for Americans recommend that a sub-group of people - anyone older than 51, African Americans, and people with high blood pressure, diabetes or chronic kidney disease - limit their salt intake to 1,500 mg a day. The IOM committee found no benefit, but possibly a risk of poor health outcomes with lower salt intake in people with these pre-existing conditions, but said that evidence is inconsistent and limited. "While the current literature provides some evidence for adverse health effects of low sodium intake among individuals with diabetes, CKD (kidney disease), or pre-existing CVD (cardiovascular disease), the evidence on both the benefit and harm is not strong enough to indicate that these subgroups should be treated differently from the general U.S. population," the report said. "Thus, the committee concluded that the evidence on direct health outcomes does not support recommendations to lower sodium intake within these subgroups to, or even below, 1,500 mg per day." American adults eat on average 3,400 mg of salt a day, according to the IOM. Groups like the American Heart Association (AHA) support reducing that number. In 2011, the AHA called for a reduction in daily consumption, recommending all Americans eat no more than 1,500 mg a day. The IOM report, the AHA said Tuesday, does not accurately assess salt impact on health. 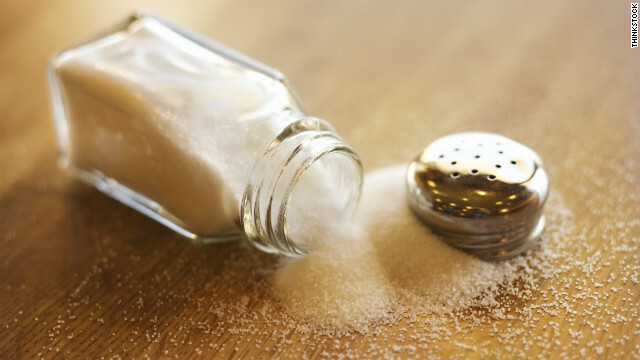 "While the American Heart Association commends the IOM for taking on the challenging topic of sodium consumption, we disagree with key conclusions," said the association's CEO, Nancy Brown. "The report is missing a critical component – a comprehensive review of well-established evidence which links too much sodium to high blood pressure and heart disease." The Salt Institute says it welcomes the IOM study, calling it a major breakthrough in the salt debate. "This whole thing has been blood pressure-driven and this study finally looks at overall health outcomes," said Morton Satin, vice president of science and research for the institute. "The study makes it very, very clear that the level of 1,500 mg that has been recommended in the dietary guidelines is not warranted, despite this full-throated cry for these levels by some organizations ... We hope this is the opening of the much broader review of the available evidence and a devotion to ensuring that our guidelines reflect the science." The IOM panel was not asked to make recommendations on what a healthy range should be. It says more research is needed to help shed light on how lower sodium levels affect health in all Americans. On Monday, the Center For Science In The Public Interest published results of a new investigation on what they call the food industry's failed efforts to reduce sodium levels in pre-packaged and restaurant foods. It called for phased-in limits in an effort to prevent heart disease. The group tracked nearly 500 food products between 2005 and 2011. "The strategy of relying on the food industry to voluntarily reduce sodium has proven to be a public health disaster," said CSPI executive director Michael F. Jacobson. "Inaction on the part of industry and the federal government is condemning too many Americans to entirely preventable heart attacks, strokes, and deaths each year." I'm really enjoying the theme/design of your web site. Do you ever run into any browser compatibility issues? A number of my blog audience have complained about my blog not operating correctly in Explorer but looks great in Opera. Do you have any suggestions to help fix this issue? Appreciating the time and effort you put into your site and in depth information you provide. It's good to come across a blog every once in a while that isn't the same outdated rehashed information. Great read! I've saved your site and I'm adding your RSS feeds to my Google account.